Vigo City Council has just inaugurated the new parking lot of the Alvaro Cunqueiro Hospital, whose name is Clara Campoamor and which was built by Misturas after being awarded the construction contract last July. 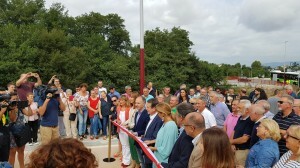 It is a ground-level, outdoor parking lot, with capacity for up to 400 parking spaces, built on a 17,000-square meter plot of land which is located next to the hospital in Vigo and connected to it by sidewalks. It has ten disabled parking spaces on the end closest to the outpatient department. These new premises were inaugurated by the mayor of Vigo, Abel Caballero. He was accompanied, among others, by the president of the Pontevedra provincial council, Carmela Silva, and the delegate of the Vigo Free Trade Zone, David Regades.